Preheat the oven to 180 C / gas mark 4 (less for fan assisted) Place the chicken in a deep casserole. Place the onion, garlic and chillies and blend to a smooth paste. Melt the butter in a frying pan and fry the onion mixture with the spices until it begins to colour. Add the lemon, coconut milk and almonds and season well. Stir the mixture then spoon it over the chicken in the casserole. Cook the chicken for 1½ – 1¾ hours basting the chicken with the sauce every 20 minutes. 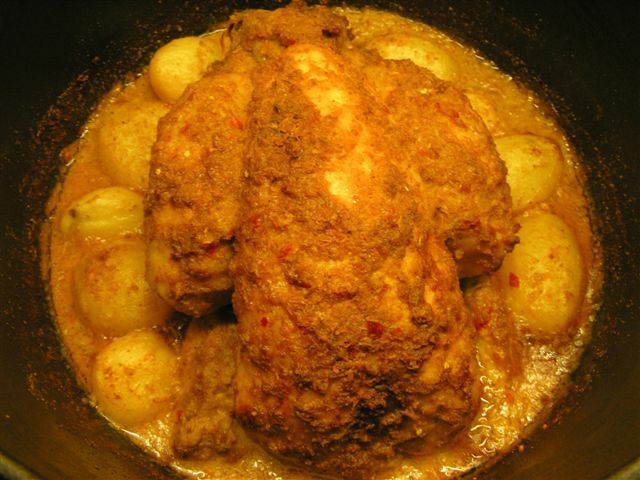 Thirty to forty minutes before the end of the cooking time place the potatoes around the chicken and make sure they are well coated in the sauce. Remove from the oven and allow the dish to ‘rest’ for 20 minutes. Cut the chicken into portions and serve with the sauce, potatoes and perhaps some stir fried pak choi as a vegetable.